I often write about conversations and people that I meet, because of wines, and my newest cast of characters will be called Mr. Fitness. Through mutual friends we became friends through Social Media. He is a fine young man, and I am even more impressed, because he refers to his wife as his Bride; already he has my admiration. I am sure that I skew the algorithms of Facebook, because I tend to “like” many postings from both old friends and new friends that I have encountered. I like to support people and am always happy to voice my tacit support, especially for joyous occasions. It was several months ago that Mr. Fitness, and I do hope he appreciates his sobriquet as I like to keep people anonymous on the web, wrote about some wines that he opened to celebrate his birthday. One was a fine bottle that almost everyone has heard of, and the other bottle he listed only as a teaser that he just had a bottle of a 1927 vintage. That is what caught my eye and I had to message him to find out what wine he had enjoyed, so that I could savor the moment vicariously through his response. 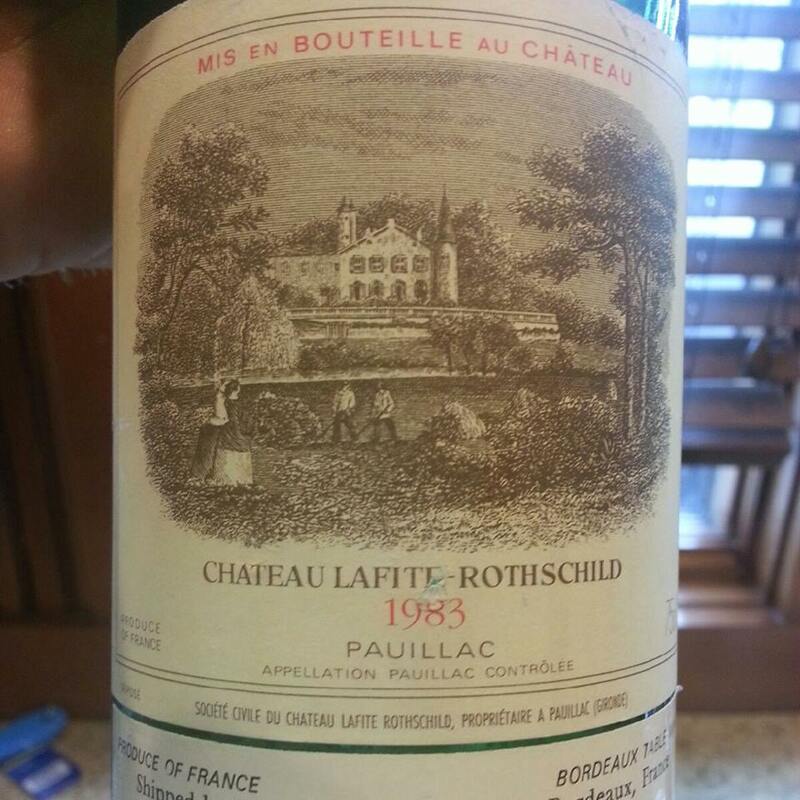 The first wine that he had on his birthday was a Chateau Lafitte-Rothschild 1983, that famous wine from Pauillac that is the first of the First Growths or better known as a Premier Grand Cru Classe from the 1855 Classification of the Medoc, which is still a great indicator of wines to this day. Chateau Lafitte-Rothschild has made what is now referred to as a classic Bordeaux blend of Cabernet Sauvignon, Merlot, Cabernet Franc, Petit Verdot and Malbec into one of the powerhouse blends that everybody strives to emulate. That he enjoyed a bottle of this heady wine, of the vintage of his birth year, is even greater. I have had the good fortune to have enjoyed the vintages of 1974, 1986 and 1989 and still have resting in my cellar two bottles one from 1973 and one from 1990, so I feel that though I have not enjoyed the 1983, I can still applaud his choice. The other wine, that really caught my attention was the 1927 vintage, and since I have just finished several other articles that were done strictly from research, I thought this was the perfect time to continue my research about another wine that had totally eluded me and was traveling under my radar after all of these years. My two “go-to” books that I always start my research with both lacked any information about the wine, so now I was on a mission to discover this wine that had piqued my curiosity. 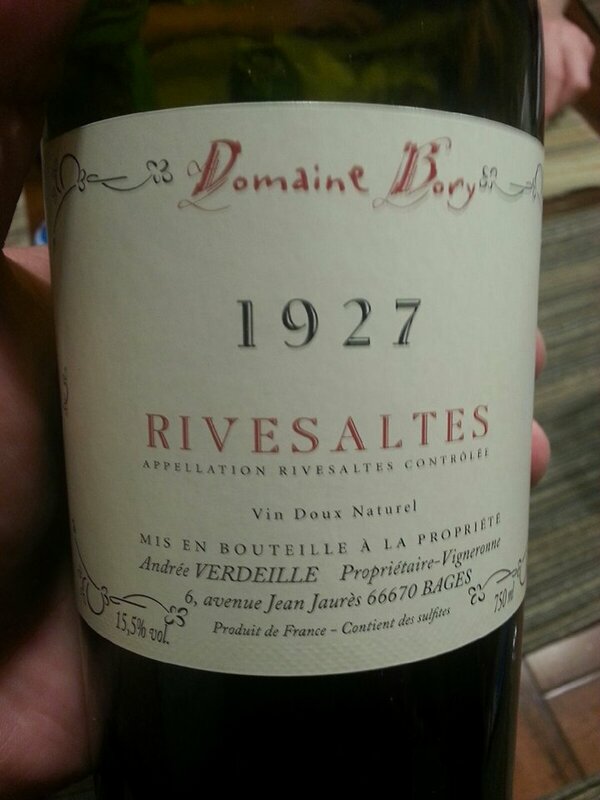 Domaine Bory Rivesaltes 1927 is from the Languedoc-Rousillon area in France that is now becoming the “hot” new area. Rivesaltes is an historic dessert wine that has been recorded in the annals of wine history from at least the Fourteenth Century. It is a sweet wine that the French refer to as Vin doux naturel, which is unlike the more famous dessert wines that are made from botrytized grapes or ice wines. The wines are made “mutage” a process of stopping the must that is fermenting while still at a high level of natural sweetness as well as at a higher level of alcohol. This wine should not be confused with Muscat de Rivesaltes, which is made from the same area, but from the Muscat grape. The appellation controlee of the wine that I am discussing here is made from all three of the Grenache grapes; Grenache Noir, Grenache Blanc and Grenache Gris. Now for sure there is another wine that I must search for to add to my knowledge of wines and I salute Mr. Fitness for his birthday choices. This entry was posted in Wine and tagged Bordeaux, Chateau Lafitte-Rothschild, Domaine Bory, France, Grenache, Languedoc-Roussillon, Medoc, Pauillac, Rivesaltes. Bookmark the permalink. I had the pleasure of trying three different VDNs from LR recently, all from the same producer but different AOCs and different years. Fantastic wines! Frank, that must have been a great tasting. Great wines to celebrate Mr Fitness’s birthday. Michelle, I agree. I think he did it up royally.